As far as motorbikes go, that awesome rush and speed comes at one downfall, you don’t have any packing space. You’re going to need a reliable backpack to pack in all of your goods, and EDC, while you cruise around. 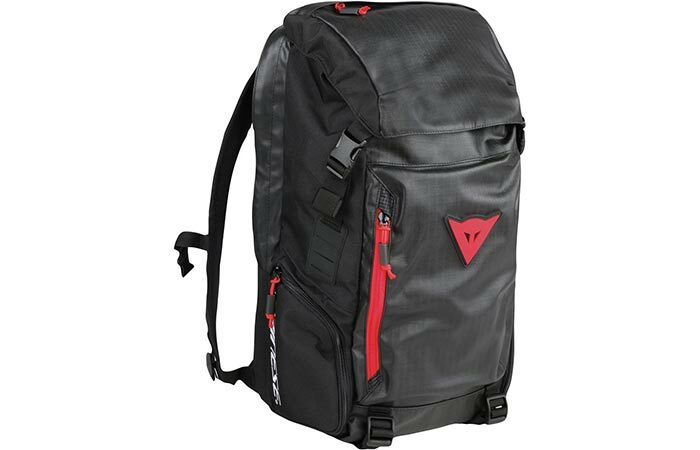 Thanks to the Dainese D-Throttle Backpack we have the perfect solution for you. Basically, the D-Throttle is a dependable, every day, backpack that makes your ride easier and worriless. The D-Throttle comes with an impressive 28-liter capacity. This is large enough for a few sets of clothes, and all of your other gear. It also comes with an external access hanging padded computer sleeve. Of course, the sleeve has been coated with a water-resistant treatment. It also features two external side pockets for beverages, or small items. Check out the video below. The D-Throttle comes with a 28-liter capacity, and a water resistant external access laptop sleeve. In addition to this, the D-Throttle also features one large front pocket, and a fleece-lined electronics pocket. It also has two internal organization pockets. The two-way adjustable sternum strap gives you stability while traveling at high speeds. This backpack measures in at 29 x 17 x 51 cm (11 x 6.7 x 20 inches).